One message that came through loud and clear at the Sage CRM Bootcamp 2015 was the move towards customers having their CRM in the cloud. Hence paying a monthly subscription. This method of procuring a CRM removes the large upfront cost of deploying an on premise solution. An on premise solution also has the associated high cost of purchasing and maintaining server hardware. Here is a link where you can sign up for a 30 day trial of Sage CRM Cloud. 2015 is projected as the year when new sales of Sage CRM in the cloud will be more than half total sales. Cloud based could be the way to go for your company. AlphaLogix can help with practical recommendations on how to get up and running quickly in this exciting new CRM based opportunity. 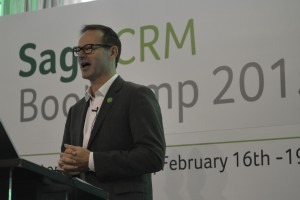 The photograph, by Peter Missen of AlphaLogix, shows Antoine Henry, Chair Sage CRM Governance Board, Segment Leader SMB Europe, CEO Sage France – the guest speaker at the opening of the Sage CRM Bootcamp 2015.